Four men inspired by al-Qaeda have admitted planning to detonate a bomb at the London Stock Exchange. 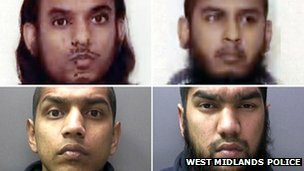 Mohammed Chowdhury, Shah Rahman, Gurukanth Desai and Abdul Miah pleaded guilty to engaging in conduct in preparation for acts of terrorism. The men, from London and Cardiff, were arrested in December 2010 and were set to stand trial at Woolwich Crown Court. Five other men have pleaded guilty to other terrorism offences and all nine will be sentenced next week. The men, who are all British nationals, had been inspired by the preachings of the recently-killed radical extremist Anwar Al-Awlaki. It emerged that those who admitted planning to target the London Stock Exchange wanted to send five mail bombs to various targets during the run up to Christmas 2010 and discussed launching a "Mumbai-style" atrocity. A hand-written target list discovered at the home of one of the men listed the names and addresses of London Mayor Boris Johnson, two rabbis, the US embassy and the Stock Exchange. The conspiracy was stopped by undercover anti-terror police before firm dates could be set for attacks. The terrorists met because of their membership of various radical groups and stayed in touch over the internet, through mobile phones and at specially arranged meetings. They gathered in parks in a bid to make surveillance difficult. The court heard that Chowdhury, 21, and his London accomplice Rahman, 28, were followed by undercover detectives on 28 November 2010, observing Big Ben, Westminster Abbey, the London Eye and the Palace of Westminster. Chowdhury, of Stanliff House, Tower Hamlets and Rahman, of St Bernard's Road, Newham, admitted preparing for acts of terrorism by planning to plant an improvised explosive device in the toilets of the London Stock Exchange. A jury had been sworn in to hear the trial before the defendants changed their pleas to guilty. Addressing the jurors as they were discharged, Andrew Edis QC, for the prosecution, said that the four involved in the Stock Exchange plot had not intended to maim and kill. "Their intention was to cause terror and economic harm and disruption. But their chosen method meant there was a risk people would be maimed or killed," he said. The men admitted the offences after a special hearing which allows a defendant to hear from the judge what sentence they may receive if they plead guilty on the eve of a trial. Chowdhury was told by judge Mr Justice Wilkie that he would receive 18-and-a-half years and Rahman was told he would receive a maximum of 17 years. Brothers Gurukanth Desai, 30, of Albert Street, Cardiff, and Abdul Miah, 25, of Ninian Park Road, Cardiff, also admitted the same count, namely preparing for acts of terrorism by planning to plant an improvised explosive device in the toilets of the London Stock Exchange. Meanwhile, Omar Latif, 28, of Neville Street, Cardiff, admitted attending meetings with the intention of assisting others to prepare or commit acts of terrorism. Four of the nine-man group are from Stoke-on-Trent, Staffordshire. The quartet talked about leaving homemade bombs in the toilets of their city's pubs and discussed travelling abroad for terror training. Three of the Stoke contingent admitted a lesser, specific charge - engaging in conduct for the preparation of terrorism between 1 November and 21 December 2010 - namely travelling to and attending operational meetings, fundraising for terrorist training, preparing to travel abroad and assisting others in travelling abroad. Usman Khan, 20, of Persia Walk, Mohammed Shahjahan 27, of Burmarsh Walk and Nazam Hussain, 26, of Grove Street, all Stoke, admitted attending operational meetings in Roath Park, Cardiff on 7 November and in a Newport country park on 12 December. The fourth Stoke defendant, Mohibur Rahman, 27, of North Road, admitted possessing two editions of al-Qaeda magazine Inspire for terrorist purposes. Following the guilty pleas, DAC Stuart Osborne, senior national coordinator of Scotland Yard's counter-terriorism team, said: "We welcome the guilty pleas entered by all nine defendants today, following what was the largest counter terrorism operation of 2010. "The investigation was coordinated by the West Midlands Counter Terrorism Unit, working in close partnership with the national CT network, Staffordshire, South Wales and Metropolitan Police, the Security Service and Crown Prosecution Service. "Our priority is, and always will be, the protection of the public." Bob Quick, the country's most senior anti-terrorism police officer until 2009, said it was an important case, with serious acts being planned. "It serves to remind us that there are still people out there in the country that are prepared to contemplate, conspire and even perpetrate serious acts of terrorism." The Liberal Democrat peer Lord Carlile, the government's former independent reviewer of terrorism legislation, said the case showed the value of the new law that made preparing for terrorism a criminal offence. But he added he was disappointed the control orders had been abandoned for "the wrong political reasons". "They should have remained in place until at least after the Olympic Games. I hope we will not rue the abandonment of control orders particularly with the tool of re-locating people who are suspected of being terrorists away from their normal home environment," he said.